HCM City (VNA) - Food Safety and Inspection Service, the public health agency under the US Department of Agriculture, has allowed two more Vietnamese firms to export catfish to the United States. According to the National Agro-Forestry-Fisheries Quality Assurance Department (NAFIQAD), this brought the number of Vietnamese firms allowed to export catfish to the United States to 60. The two new firms are Hua Heong Food Industries Vietnam and Cuu Long Fish Import-Export Corporation. NAFIQAD asked the two firms to actively check its catfish products to ensure requirements of the US Food Safety and Inspection Service are met. In addition, firms must register to get certificates for seafood exports at one of the NAFIQAD branches, which was compulsory to export catfish to the United States. From the beginning of October, certification for seafood exports will be conducted via the national window system. According to NAFIQAD, the United States will inspect food hygiene and safety of catfish products exported from Vietnam to the United States, especially tra and basa fish, from July 7 to October 15. Recently NAFIQAD asked firms which have never exported catfish to the United States to stop registering for exporting to this market. It said the United States would not permit new exporters with no previous experience in exporting catfish to the country during the period of evaluating the food safety supervision system of Vietnam on tra fish. According to the Vietnam Seafood Exporters and Processors, the United States is the largest importer of Vietnamese tra fish, with an export value of nearly 255 million USD in the first eight months of this year, rising by 22.4 percent over the same period last year. The United States was followed by the European Union markets, with export revenue of more than 177 million USD. 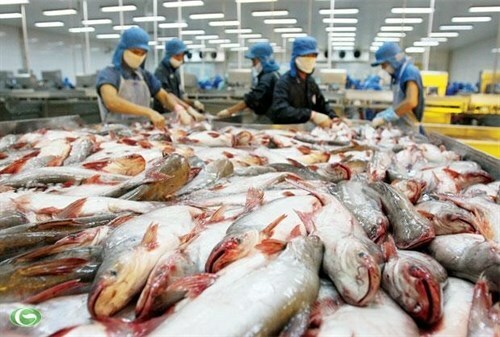 In the first eight months of this year, Vietnam earned 1.1 billion USD from exporting tra fish, representing a rise of six percent against the same period last year.